On December 30, 1927 (Showa 2), Japan’s first subway line started running between Asakusa station and Ueno station, Tokyo. 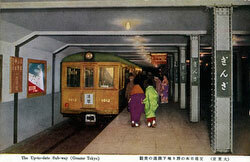 The line was called Ginza Line in 1953 (Showa 28). 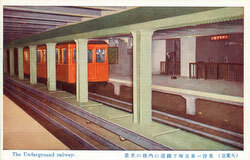 The idea for a Tokyo subway system was conceived after businessman Noritsugu Hayakawa (早川徳次, 1881-1942) rode the London Underground during a visit to London in 1914 (Taisho 3). The Tokyo Underground Railway (Tokyo Chika Tetsudo) was founded in 1920 (Taisho 9), and construction was started in 1925 (Taisho 14). 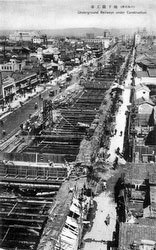 On December 30, 1927 the first section, connecting Ueno and Asakusa was opened. 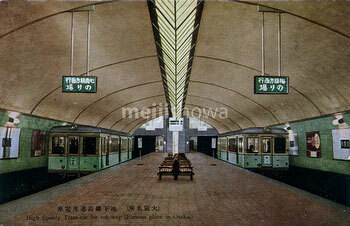 The line was extended to Kanda on November 21, 1931 (Showa 6). Initially, passengers often had to wait for as long as two hours to ride the incredibly popular subway. Tokyo Underground Railway became part of the Teito Rapid Transit Authority in July 1941 (Showa 16).